Get the look of a perfectly layered ensemble all in one piece with the Royal Velvet Drape Sleeve Gown. This lush velvet gown has soft, satin ruffles at its neckline and its long sleeve cuffs, creating the look of a white chemise underneath. The long, close-fitting sleeves are made of satin that matches the color of the velvet gown, and an open, draped velvet sleeve over top adds even more elegance to the design. Thick gold trim accents the round neckline, and thinner lines of matching gold trim embellish the inner sleeve cuffs and included waist belt. Lacing down the back of the dress is adjustable for your perfect fit. This velvet Renaissance gown is available in a variety of colors and a range of sizes. 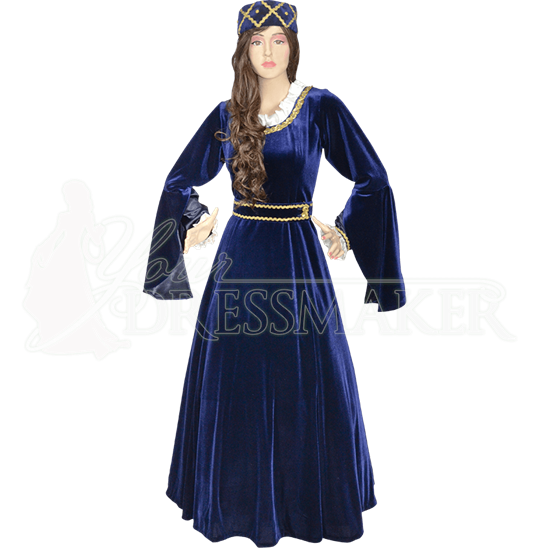 Both impressively regal and easy to wear, this medieval nobles dress is perfect for Renaissance fairs, reenactments, special occasions, and more. Accessorize this velvet gown with the perfectly matched Royal Velvet Noblewomans Hat (MCI-492), sold separately.